Congress President and UPA Chairperson Sonia Gandhi on Tuesday while addressing election rallies in the poll bound Meghalaya said that the Centre and the state government are seized of the problems of immigration and illegal mining which are core issues of the people in the state. 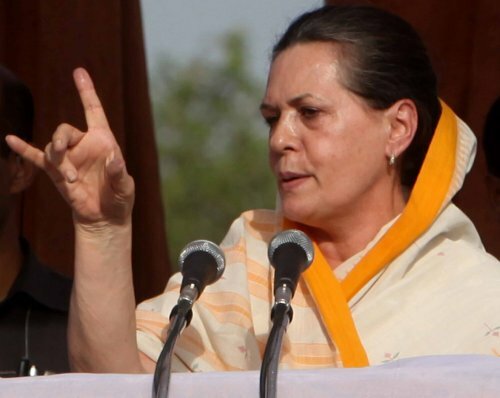 "The governments both at the Centre and the state are engaged in talks with Bangladesh to see how to stem illegal immigration and I am hopeful that we will reach a solution to the satisfaction of all sides," said Sonia Gandhi at an election meeting at the Kiang Nangbah College ground in the state. "I am also aware that illegal mining is a threat to the environment...I must say some measures have already been taken and we will continue to do so in our efforts," said Sonia Gandhi. Noting that Meghalaya was one of the fastest growing states, she said it excelled not only in development, but also in administration. "In many ways Meghalaya has grown far more rapidly than most other states in the North East and perhaps in the country," Sonia Gandhi said. The Congress president spoke on improvement of sports activities and infrastructure in the state. Sonia Gandhi added, "We also have not forgotten our farmers. They have received financial support and we will continue to implement our agricultural development schemes especially for the marginal farmers of the state." Stating that the February 23 election was of great significance, Sonia Gandhi said, it allowed the people to judge "how we, as a party, helped the people realise many of their expectations". "We are always mindful of the expectations and aspirations of the people and we do not intend to rest on our laurels. Having been in power has not rendered us complacent," said the Congress President. At another election meeting at Tura, Sonia Gandhi spoke on the development undertaken by the Congress-led government in the state. Urging the people of Garo Hills to repose faith in the Congress, Sonia Gandhi, "We have ensured an era of peace, prosperity and stability. This is a development of which everyone can be proud, this is yours in which everyone has a share." Congress President and UPA Chairperson Sonia Gandhi while addressing a Congress rally as part of her campaign for the upcoming Meghalaya polls highlighted the achievements of the Congress-led Meghalaya government as well as the UPA Government at the centre. Sonia Gandhi said that Meghalaya is one of the fast growing states not only in the North Eastern region but across the country. Congress President and UPA Chairperson Sonia Gandhi addressed a Congress rally in Meghalaya where assembly elections are going to be held in February. 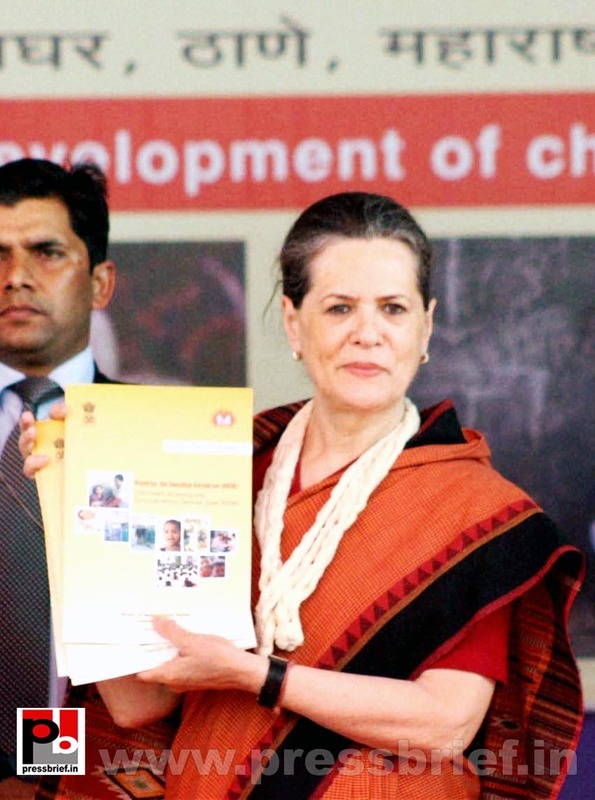 Sonia Gandhi praised the Congress-led Meghalaya Government for the good works done by it. Sonia Gandhi assured AMU of finding a solution to its minority status issue. Congress President and UPA Chairperson Sonia Gandhi promised to put in best possible efforts to resolve the issue of AMU's minority status. She also assured the officials of an appropriate action regarding the improvement in university's infrastructure. Congress President and UPA Chairperson Sonia Gandhi said that Aligarh Muslim University has supported India's nationalist and secular ideals and has become an example Unity in Diversity. She also appreciated AMU's efforts in providing modern education while still upholding the principles of its founders. Congress President and UPA Chairperson Sonia Gandhi at Aligarh Muslim University, for over a century, has made its name as a strong pillar of nationalist and secular education by being a steadfast inculcator of modern education and has kept alive the principles of its founder by following the path shown by him. The greatest asset of Indian republic is unity in diversity and its 'ganga-jamuni tehzeeb'. AMU is the eptome of this 'tehzeeb'. This university's commitment regarding 'unity in diversity' is not just an act of tokenism but a truth evolving from the experience of its founders. It is proof of the fact that unity in diversity is not just a hollow slogan but a pledge and those principles that are associated with the foundation of this university and get reflected in its teaching, outlook as well as its day to day life. Congress President and UPA Chairperson Sonia Gandhi at Aligarh Muslim University, for over a century, has made its name as a strong pillar of nationalist and secular education by being a steadfast inculcator of modern education and has kept alive the principles of its founder by following the path shown by him. The greatest asset of Indian republic is unity in diversity and its ‘ganga-jamuni tehzeeb’. AMU is the eptome of this ‘tehzeeb’. This university’s commitment regarding ‘unity in diversity’ is not just an act of tokenism but a truth evolving from the experience of its founders. It is proof of the fact that unity in diversity is not just a hollow slogan but a pledge and those principles that are associated with the foundation of this university and get reflected in its teaching, outlook as well as its day to day life. I am aware of the fact that case regarding minority status of AMU is pending in Supreme Court. I assure you that I would make every possible effort to help maintain the strong reputation of this great university. Vice Chancellor talked to me about improving the infrastructure of the university. Congress president and UPA chairperson Sonia Gandhi delivers the convocation address at Aligarh Muslim University. She is the second women to deliver convocation address at the prestigious university. She said, Aligarh Muslim University, for over a century, has made its name as a strong pillar of nationalist and secular education by being a steadfast inculcator of modern education and has kept alive the principles of its founder by following the path shown by him. The greatest asset of Indian republic is unity in diversity and its ‘ganga-jamuni tehzeeb’. AMU is the true epitomization of this ‘tehzeeb’. This university’s commitment regarding ‘unity in diversity’ is not just an act of tokenism but a truth evolving from the experience of its founders. It is proof of the fact that unity in diversity is not just a hollow slogan but a pledge and those principles that are associated with the foundation of this university and get reflected in its teaching, outlook as well as its day to day life. I am aware of the fact that case regarding minority status of AMU is pending in Supreme Court. I assure you that I would make every possible effort to help maintain the strong reputation of this great university. Vice Chancellor talked to me about improving the infrastructure of the university. Few days ago I even got the memorandum of your students union. I will surely talk to government regarding all these issues and make every possible effort to do my bit to resolve this issue. My family has had a deep relationship with the Aligarh Muslim University. Pt. Jawaharlal Nehru had such relations that despite his busy schedule he took out time to repeatedly visit this place. The University has awarded me an honorary degree as well and student union has also accorded me with a lifetime membership. I am proud that you have always enthusiastically supported us and many of the institutions here derive their name from the members of my family. The Culture of India is one of the greatest evolutions in the human civilization. Any facet of life, whether social, cultural, political or literary, has not remain untouched by its influence. Whether one observes the grandeur of the surrounding buildings and architecture , turn the pages of history or looks at its music, poetry and painting , our culture’s signs will be found everywhere. It has got embedded in our souls. Islam has amalgamated with soil of this country in a such a way that now it has become its inseparable part. Here Muslim community has established a dignified image and played an important role in country’s development. Pt. Jawahar Lal Nehru have described this contribution in innumerable words in his book ‘Discovery of India’. This community has given India a great crop of leaders who played an important part in our freedom struggle. This university is itself associated with many great personalites. Abdul Gaffar Khan, Maulana Shaukat Ali, Mohammed Ali, Zakhir Sahab, Hasrat Mohani, Rafi Ahmad Kidwai, Abdul Majeed Khwaja, K N Ashraf, Saifuddin Kitchlew and Sheikh Abdullah are few of the great examples who inspired the future generations. It gladdens me to know that so many young women are receiving their degrees today. No community can really progress or prosper if half of its population lags behind. Aligarh Muslim University, Abdullah Girls College has produced remarkable women like Dr. Rasheed Jahan and Ismat Chugtai and many others who through sheer grit and determination confronted social prejudice and antagonism to earn their place in life and the respect of their peers. They are inspirational figures. They should be your ideal. The path of success and independence has never been easy and change is never given to anyone on a platter. You have to struggle, you have to work hard, you have to persevere and never despair. You will confront situations, you will meet people who will try to discourage you, you will meet people who will tell you things cannot change, do not believe them. The country needs women professionals in every field of life. You owe this to your parents, your teachers and this great institution that has given you the opportunity to pursue your dream. You can and you will succeed. All of you young women and men have had great and good fortune and privilege of spending some years in the portal of Aligarh Muslim University deriving the intellectual and moral sustenance that prepares you for your future. Many of you will go on to great endeavors and high achievements as indeed you should. But it is my hope that as you make your way through life you will give thought to those who have been less privileged than you, that whenever you can you will extend them a helping hand. The world is an unequal place but its harshness can be mitigated greatly if we only remember that we are the members of a larger society in which all of us must live and share. It is up to us too and it is our responsibility not just to do well for ourselves but to ensure that the country at large and our people at the whole make progress. Today youth are the future leaders of the nation. You are the future leaders of our nation. We want you to develop a questioning outlook to look beyond the obvious, to question that you see and to engage with the real issues. Only then can you provide leadership not only in the areas of knowledge but in other spheres as well. You must believe in yourself and your ability, always tinkering it with the knowledge that however imperfect the world may be there is always a larger good illustrious goal and the greater community than the individual. As Illama Iqbal said, “sitaro se aage jahan aur bhi hai” (there is a world beyond stars) . If you keep this in your mind you will be in harmony with Sir Syed’s vision and wisdom which led him to establish the institution form which you are graduating. And if you do then this university, its faculty, its college and its students will remain in forefront of India’s continuing resurgence. The ideals of this great institution are to touch the sky. They are echoed in your university Tarana, ‘jo abra yahan se uthega who saare jahan mein barsega’(the clouds to leave this place shall rain all over the world). My blessings will be always with you. Jai Hind. Congress President and UPA Chairperson Sonia Gandhi inaugurated a conference of the South Asia Autism Network in New Delhi on Monday. Representatives from India, Bangladesh, Thailand and WHO, SEARO will participate in the daylong conference. "It is simply not acceptable that we perceive people with autism as people who don't have any understanding. We need to change. We must make the world a comfortable place for those with autism. We need to learn to respect those who may perceive and experience the world differently from us. We need to empathize with them" said Sonia Gandhi. "We need to focus on not what is different about them, unfamiliar movement, unexpected expressions, unusual silences, uncommon imagination but on the vastness of what we have in the common as equal members of one humanity" she added. Congress President and UPA Chairperson Sonia Gandhi inaugurated a conference of the South Asia Autism Network in New Delhi on Monday. Representatives from India, Bangladesh, Thailand and WHO, SEARO will participate in the daylong conference. “It is simply not acceptable that we perceive people with autism as people who don’t have any understanding. We need to change. We must make the world a comfortable place for those with autism. We need to learn to respect those who may perceive and experience the world differently from us. We need to empathize with them” said Sonia Gandhi. “We need to focus on not what is different about them, unfamiliar movement, unexpected expressions, unusual silences, uncommon imagination but on the vastness of what we have in the common as equal members of one humanity” she added. The Congress President continued “Human society has expanded the frontiers of knowledge and seen the eradication of many debilitating diseases, yet in the case of autism, despite its widespread prevalence, an understanding for its causes remains elusive”. “ Professor Saima Wajid Hussain has just given us some figures that tell us that autism specter disorder is on the increase. We probably have over 8 million individuals with autism spectrum condition” said SoniaGandhi and added “Our ministers have just spoken to us about many initiatives and the programmes which have been started here in India, including some changes in some policies. However, I feel that the fulmination of public policies in our countries is not kept pace and not enough attention has been given to disability sector. In the absence of adequate institutional support mechanism, the differently abled remained deprived of their rights”. During the conference, representatives from India and Bangladesh will present the official SAAN charter for adoption by all network member States. The charter notes the commitment to the following goals: To raise public and professional awareness of ASD; to provide resources for parents and professionals; to collect public health data to understand the burden of ASD; to conduct professional training in the areas of evidence based services to meet the life cycle needs of persons with ASD. It will also encourage in ASD, promote inter-country sharing of data resources and expertise and to explore funding mechanisms to achieve the above goals and objectives. The WHO shows an escalation in the disease burden for autism from 10 percent to 14 percent over the period 1990 to 2011. It is expected to rise to 15 percent by 2020. After the adoption of Dhaka Declaration on 25 July 2011, the South Asian Autism Network (SAAN) was born to combat the devastating autism public health crises. The intention is to identify common challenges each country is facing and form a partnership to develop solutions in a collaborating and coordinated fashion. The intensions include establishing a regional autism awareness campaign in South East Asia, creating joint programmes for information-sharing and professional training, and defining national and regional strategies to advance autism public health research and policy development. Congress President and UPA chairperson Sonia Gandhi thanked the officials for the launch of the new health care scheme and promised the people that the Congress-led UPA government will always be committed towards their welfare. Congress President and UPA chairperson Sonia Gandhi assured tribal groups that the government was committed to safeguard their rights by giving the example of Forests rights act which safeguard their rights to use forest products. She also felt great happiness by seeing the enthusiasm shown by assembled children for the launch of scheme. 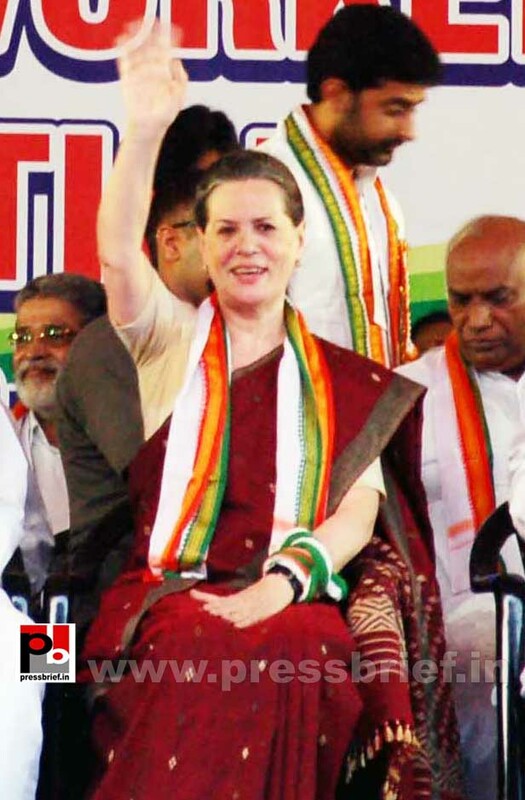 Congress President and UPA chairperson Sonia Gandhi highlighted the need to raise the status of women. She also listed the measures taken and laws enacted, like Domestic Violence bill and the recently passed ordinance, to fight the crime against women. 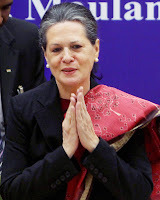 Congress President and UPA chairperson Sonia Gandhi spoke that she was aware of many challenges like malnourishment. She besides highlighting the interconnected issue of woman and infant health discussed food security bill and other schemes devised to fight the scourge of malnourishment. Congress President and UPA chairperson Sonia Gandhi explains the benefits of right to education act as well as ICDS and Mid-day meal scheme in improving the health and knowledge of children. She also lists the measures to prevent the sexual abuse and crime against minors. Congress President and UPA chairperson Sonia Gandhi called the schemes a link between the villages and the administration and explained how it would train lakhs of uneducated women to become nurses and besides earning a living, contribute in country’s healthcare programs. Congress President and UPA Chairperson Sonia Gandhi at Congress' Jaipur AICC session. She has been a true secular and democratic Congress leader. She always stressed for the need of welfare of the aam aadmi, especially the poor, downtrodden, the underprivileged and minorities. She was the main force of inspiration for the Congress-led UPA government which brought in several land mark schemes like MNREGA. Congress President and UPA chairperson Sonia Gandhi stresses the importance of children in shaping the future of the country. She also describes the other UPA flagship programs and the amount of funds allocated for improving women and child healthcare. Congress President and UPA chairperson Sonia Gandhi congratulated the august assembly of ministers as well as the children and public for the successful launch of Rashtriya Bal Swasthya Karyakram. She also assured the people that the scheme will go a long way in improving the children and women healthcare. Congress President and UPA Chairperson Sonia Gandhi visited Nagaland on Thursday to campaign for the February 23 Assembly Elections in the state. While addressing a Congress rally in Dhimapur Sonia Gandhi urged the voters to support Congress and oust the ‘corrupt’ NDA Government in the state. She addressed public meetings at Mokokchung and Dimapur districts. The Congress has been in opposition in Nagaland since 2003. The present state government is not concerned for the welfare of the people or development of the state, alleged the Congress President. There is rampant corruption all around, said Sonia Gandhi. Sonia Gandhi also said the Congress-led UPA Government at the Centre led by Dr. Manmohan Singh has brought in a number of welfare schemes and landmark legislations for the welfare of the people and the development of the country. She also said that the Centre has been sending huge funds for agriculture and other activities to every state but in Nagaland the said funds are not reaching the beneficiaries. The people of Nagaland want a progressive, forward looking and pro-development government and only Congress can provide it, claimed the Congress President. Sonia Gandhi urged the people to support Congress and help it to form a corruption free and pro-poor government in the state. Congress President and UPA chairperson Sonia Gandhi launched a new scheme on Wednesday to improve child healthcare under the National Rural Health Mission. “Today a new lamp of Rashtriy Bal Suraksha Karyakram (RBSK) has just been lightened. 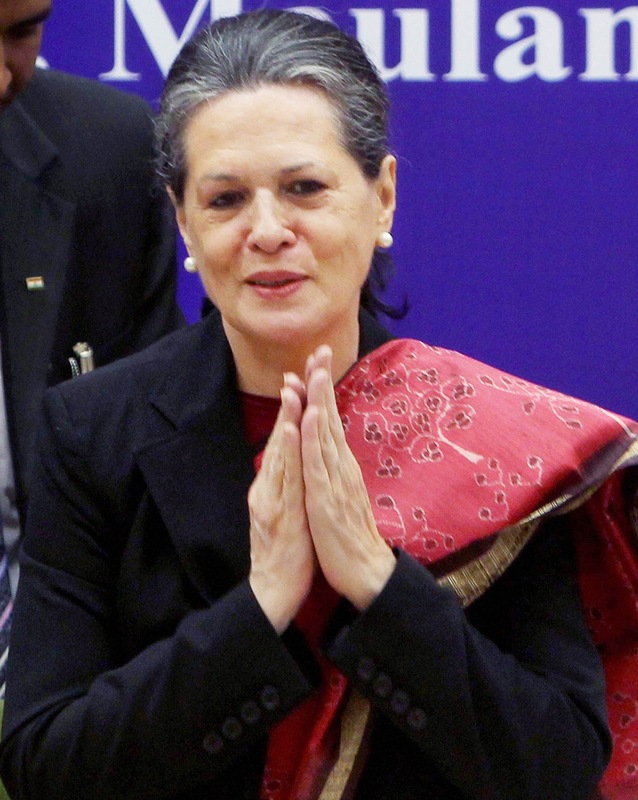 Its light and its message will spread throughout the country” said Sonia Gandhi while speaking at the launch function. She added that the health of children is directly linked to the well-being of the mother, for which the central and state governments have taken several measures. "Nearly 40 percent of children in the country continue to be malnourished, a matter of grave concern. I am confident that the RBSK will prove to be successful in controlling the problem," Sonia Gandhi said. She pointed out that just a few years ago, over 2,00,000 children fell victims to polio each year. "Now, India is polio-free, a major achievement for the country as a result of the initiative taken by Rajiv Ji,". She further said that the Food Security Bill would contribute towards reducing malnutrition among children. “To make children’s life healthy and cheerful we have taken many steps. We passed the Right to Education Act so that no child of this country remains bereft of the benefits of education” said Sonia Gandhi. Under this new scheme every child younger than six years would be screened for 30 select deficiencies and disorders. The scheme, named Rashtriya Bal Swasthya Karyakram (a child health screening and early intervention initiative), has been kicked off at Palghar, a tribal block in Maharashtra's Thane district, which envisages issuing a follow-up or treatment guidance to children, depending on their symptoms and health status. The government plans to roll out this scheme for 27 crore children under 18 years in phased manner. The 30 deficiencies and disorders that children would be screened for include anemia, vitamin A, vitamin D, acute malnutrition, goiter, alongside some congenital diseases such as cataract, deafness, heart diseases. It is estimated that about a tenth of India's die of birth defects, while hearing or vision-related developmental delays affect 10% of children, which could lead to permanent disabilities later in life. The services will be provided through dedicated mobile health teams, comprising two doctors (one male and one female), nurse and a pharmacist, located in every block. The teams will carry out screening of all the children up to the age of six years and enrolled at Anganwadi centres at least twice a year. It will also screen all children enrolled in government and government-aided schools.